A two-year investigation by The Mirror newspaper revealed that dog thefts rose by at least 20% in the UK. The research revealed more than 2,400 dogs had been stolen in a two year period with the illegal activity worth an estimated £100,000 to criminals. 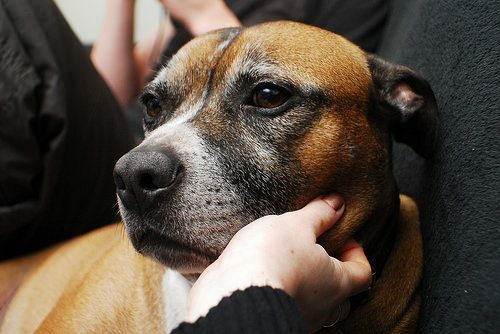 Staffordshire Bull Terriers, according to their study, were the most stolen dog breed, which could worryingly be tied to a rise in dog fighting reports. How to Keep Your Dog Safe: How Do I Prevent My Dog Being Stolen? After the theft of their Miniature French Bulldog , Tim Bristrow and Jayne Hayes set up Doglost. Following an agonising six week search the couple got a tip off relating to the whereabouts of their missing dog Hermy, which lead them to the idea that spawned Doglost. In just one calendar year Tim and Jayne managed to reunite over one thousand missing dogs with their owners. An alarming amount of missing dogs, some of which were stolen from their owners. Determined to find out where her beloved Spaniel was, Lavinia scoured the country for news but for four months, heard nothing. Just as she began to fear the worst, she saw Sheena Seagrave of Missing Pets Bureau on the Richard and Judy Television Show and realised there was someone who could help. Whenever an un-spayed dog is stolen, Missing Pets Bureau recommends the owner checks their local papers for adverts selling litters of the same breed. Knowing Molly had recently been in season, Lavinia didn’t miss a single copy and just days later, on 6th August, there it was: an advert for eleven Springer Spaniel puppies! Sadly, one of the eleven puppies had died and eight had already been sold to unsuspecting buyers. Lavinia believes the dognapper could have made as much as £2,000 from the litter. Missing Pets Bureau also advises against buying pets from unknown sources like local fairs and newspaper adverts. Instead, it is recommended that you visit your local rescue centre to give a much needed home to a rescue pet. The pet insurance industry has first hand knowledge of how fast this crime is spreading throughout the country. How Can The General Public Help in the Fight Against Dog Theft? They can join the existing volunteer helpers by logging on with www.doglost.co.uk - by checking the site regularly for dogs missing/found in their area, the success rate can be boosted from 70% to 100%! This will take ten minutes, two or three times a week! People who do not own a computer can get access via a library, internet caf?, or even use a friend’s or relative’s computer. Be vigilant! If a dog suddenly appears in your neighbourhood and you are concerned/suspicious about its origins, contact www.doglost.co.uk – this service is discreet and could give you important information. Get involved with the initiatives published on the website. Write to your MP asking pertinent questions about dog theft. Put posters of missing dogs up in your area. To achieve these aims we will be talking to as many organisations as possible in order to draw on their expertise, experience and resources. Our first project was to attend CRUFTS in 2005, to ask the dog owning public to help us in our campaign. The Kennel Club press office kindly offered us space in the entrance of the NEC over the four days of the CRUFTS show. We distributed 25,000 leaflets to people from every aspect of the dog world, encouraging them to join us in this vital campaign. What You Can Do to Take Action Against Dog Theft? Have your dog micro chipped and tattooed. Both methods are painless and cost around ?9-?35. All dogs should wear a collar and tag by law. Avoid including the dog's name. Include your home/mobile telephone number/address - use a tracking company’s details if you don't want to include your own. Have clear photos of the front, rear as well as side profiles of your dog. Make a note of unusual markings. Train your dog not to go out of your sight on walks. Use an extending lead if the dog does not comply. Beware of strangers - don't give details about your dog. Vary your walk times and routes. NEVER tie your dog up outside a shop. NEVER leave your dog unattended in a car. Fit a cow bell to your gate so that you can hear trespassers. Ensure your fencing is adequate and check it regularly for wear and tear.